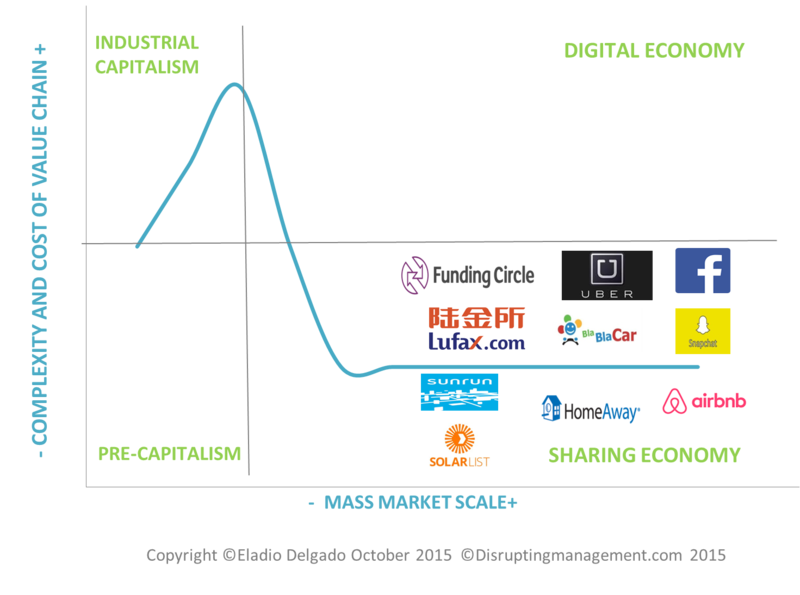 After 2 centuries of hegemony of the last human economic system, the industrial and modern capitalism, a new economic system, the sharing economy, and its relative, the on-demand economy, emerges in the past few years as a logical evolution of the digital and information society from the late 90s of the past century. The starters of this new sharing economy – the global leading Unicorns – go beyond the micro-economic changes, being not only disruptive new leaders in their own industries, but truly global economy changers and ambassadors of an emerging after-capitalism economic system, with different rules and common disrupting patterns, and with a new correlation between economy factors, both from the supply side of the economy and from the demand side of the economy. Capitalism, in a very general conception, relies on a common principle of investing large capitals and resources in complex production, supply and business chains, to scale up production and reach mass markets and economies of scale in any sector or industry. 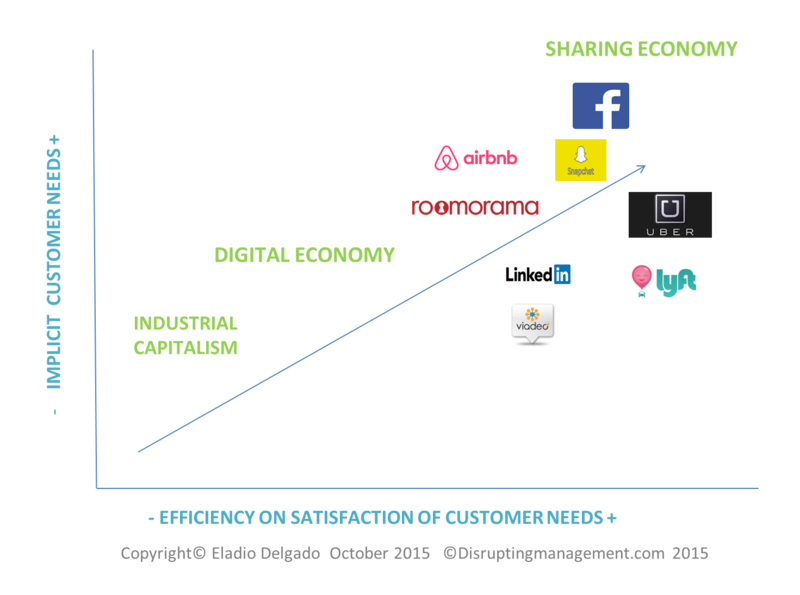 But the digital and sharing economy change the rules: on the offer side of the economy, it draws a curve of a new efficiency that combines 2 factors that were contradictories on classic capitalism: the simplification of the business value chain, and nevertheless, an exponential market scale performance. How? With a better digital efficiency. We can find another reason to this exponential scale, by searching on the demand side: these new players understand new implicit customer needs inside traditional industries, developing new markets inside the industry, scaling exponentially and attracting huge funding from venture capital. We will try to give a more detailed explanation of this process. 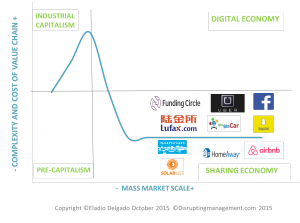 Industries and sectors are formed naturally, on decades or hundred years, around ecosystems and group of actors that addressed concrete customer and society needs, supported by concrete technologies and business models. Periodically, this process of fulfilling the needs of society is enhanced by more efficient technologies and business models that make actors and industry the more and more sophisticated. But a real disruption in an industry happens when a new actor understands implicit customer needs emerging from traditional sectors and activities and drives them into a whole new market inside the industry, and finally performs to match them in the more efficient way. The XXI century the social network phenomenon broke the rules of the Media and Advertising industry as a social digital network, Facebook, realized that in order to attract the advertising industry there was an implicit customer need to satisfy. Beyond searching, producing, editing and delivering standard news to mass audience, they allow people to publish and share personal news, and provide them with a technological and efficient way to do that. Facebook now is the most read media in the world with more than 1.300 million of users, readers and publishers. 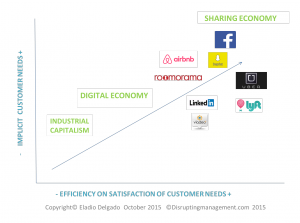 Same for Tourism industry: Airbnb, born in 2008, realized that it could be an implicit customer need to fulfill around the concept of “urban accommodation”. And to meet this need they could go around the traditional offering based on owning and building hotels and renting rooms. In 2015 Airbnb has more rooms available than the 3 leading world hotels chains as Hilton, Intercontinental or Marriot. In Transport and Travel industry, Uber started to offer solutions without having any own driver and vehicle. Now they have above 1 million drivers registered, more than any world urban taxi company. In Human Resources industry, LinkedIn disrupted the hiring and employment agencies and headhunters industry, by understanding an implicit customer need to satisfy, i.e. showing personnel talent. Now they are the largest world professional tech marketplace. In Finance industry, Lufax, the Chinese sharing platform for financial loans, has arranged more than 2.5 billion dollars loans since 2012, with no owned capital funds. Understanding these new rules of the game in the proper way will be key for the future competitiveness and the survival of the rest of the players of the traditional economy. Eladio Delgado is a senior management and investment advisor, with a trajectory in consultancy and presence in public organisms, startups ecosystems and leading Business Schools. He currently advices on European Commission program “Startup Europe” and teaches on digital transformation at IE Business School on its executive education department. He got a Master in Telecom and IT Management by the Polytechnics University of Madrid, and holds a double degree in Law and Economy by the University of Deusto in Spain.